If you’re just joining us now and want a quick way to catch up, you can download the starter project we created through in the first 3 articles of this series: v1.0.zip — Create the Game. There are several attributes that an automated test should have, and if any one of these are missing, your test suite could quickly become more burdensome to execute, and more costly to maintain. Tests should live within the code. The automatic version control of our tests with our code. We can run the test suite for any version of our project, and that test suite should successfully test that version of the code. Tests in the project code (src/test/java) enable us to easily perform the tests on every build, and/or with a simple mvn test command. Tests need to be fast! Entire suites of hundreds or thousands of tests should be able to execute within a few minutes or less. Tests should not rely on mocks! “Don’t mock me!” Tests should use actual resources, not rely on Mocks that represent perfect best case scenarios for inputs (and in worst case, are laden with bugs themselves). We want to be able to commit data, retrieve that data, modify the data, take actions, and validate logic all within the same end-to-end test. Tests should be query and assert against your application’s APIs. If you use CDI or a dependency injection container, your tests should be able to inject bean instances so we can inspect and validate any of our service or model values at any point in any test. Simple JUnit tests are fast and live directly in the code, but when complex Mock-objects are required, it becomes impossible to test actual functionality of end-to-end flows. Using Selenium with JUnit can help address the HTTP/Web testing problem, but you still wont be able to inspect server-side values during test execution; Selenium only grants tests access to the information presented to the browser, so how do we test browser-based flows, while still having access to assert against our server-side data? Arquillian is an Integration Test Framework developed by JBoss. It enables real testing of Java applications “in-container,” granting access to all server-side resources running on an actual environment like the one in which your application will be deployed. We can query the database in our test, inject services into our test, change data values in our test, and best of all, Arquillian makes all of this possible simply by extending your Junit (or TestNG) unit tests; your test suite can run with every build, against any environment. Arquillian is an integration testing framework, and should be used to supplement (not replace) your unit test suite. Proper unit testing is essential to maintain the ability to refactor internal code and services, and should not be omitted in favor of pure integration testing. If you’d like to follow the official Arquillian guides, feel free to learn and go through them at your own pace. Or you can follow the instructions below for a more tailored example and explanation. The first thing we will do is re-open our project in Forge, then we will install the Forge-Arquillian plugin that will greatly simplify all of our configuration and setup work. Use the following commands to return to your project (replace “my_facebook_project” with the path to your actual project,) and install the Forge-Arquillian plugin. You can simply hit <Enter> to select all the defaults for Arquillian version, JUnit version, and Container version. This will ensure that you have a working Arquillian installation configured for JBoss AS 7 and JUnit. 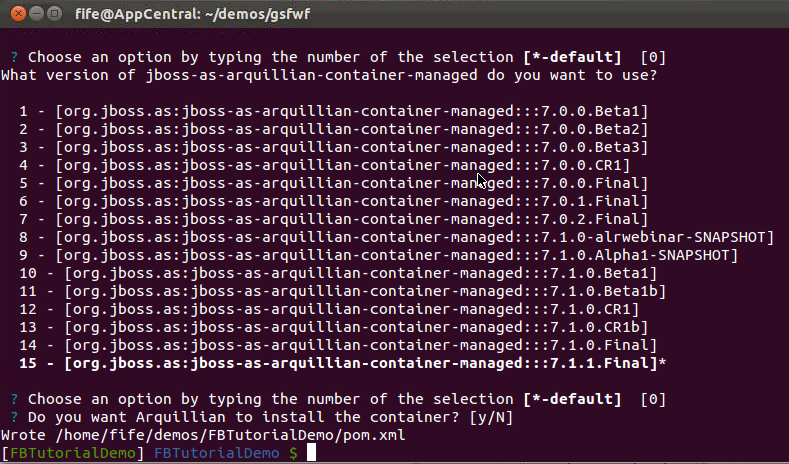 Now that we have Arquillian installed and set up (that was easy! ), it’s time to create our first Arquillian test; we again turn to Forge for help. We’re going to start out by creating a test class for Player in which we’ll end up testing some basic functionality around storing and retrieving players. Lets go in and open the test file in your IDE and make the following changes. If you have trouble running this command from the Forge Console in Eclipse, a native Forge terminal may provide better success. Congratulations!!! You’ve just created and run your first automated Arquillian test. If you had any trouble following along, simply grab the code to this point from github tag: v1.1.zip — Install Arquillian and Sample Test . In this next test we use playerPOSTRequest to post a new player with 1 friend, which means we are also creating One Friend as a User and then adding him to the friendList. We test a few of these things with Assertions, and then perform a GET on points, and then a playerRemovalRequest and Assert those as well. Now when we do another build --profile JBOSS_AS_MANAGED_7.X in Forge we see we’ve successfully tested that our internal workings of our web service (specifically several services around Players) are all working correctly! This is great! We can see how to create automated test cases where we can inject our databeans and assert the value of various attributes even in the middle of a use case flow! In our case however, you may be wondering, “But what about ensuring the WebService calls through http GET and POST requests like a real user would be doing?” This is a fair point since the above test basically bypasses the fact we have a WebService with endpoints by simply calling the desired method directly. Arquillian allows for 2 ways to run your tests; in-container mode (the default) which you’ve now seen, and client mode which lets you test outside the container just like an actual user. Lets set up another Test Class for MyWebServiceTest.java where we’ll put all our other tests, and we’ll setup this entire class to run in client mode so we can test the actual GET and POST calls just like a client would. If you had any trouble following along, simply grab the code to this point from github tag: v1.2.zip — Arquillian In-Container Example . Now it’s time to set up some data for our tests. It is worth noting that there is never any guarentee as to which @Test method will run before any other, no matter where you put them in your class. The only methods with guarenteed order are annotated @Before and @After test execution. These methods run before each test is run, and after each test is run, respectively. We can use this to set up a bunch of data that we can use in all our tests, ensuring that it is reset for each @Test method. We can do this by creating some useful GET and POST methods in a Util class that can reference our WebService. Showcasing the true power of Arquillian, we are GETing and POSTing true database objects! You’ll see absolutely no mocking in any of these tests!!! The next step is to set up Gson (Google’s JSON / Java library) in our project so we can convert JSON responses from our web-service back into actual Java classes, effectively creating a simple REST client inside our test case. We can do this by simply adding the dependency to our pom, and the gson-2.1.jar file to our project classpath. returnVal = "Failed : HTTP error code : "
String targetURL = baseContext + "rest/webService/UserRequest/"
The code above should be understandable as is, since we are simply creating 2 methods which execute our GET request and POST requests, respectively. This is straightforward template code that you can find anywhere on the internet for performing GET and POST calls from Java. The HTTPResponse from each request is returned as a string and then converted to it’s proper Java object through Gson so we can examine it in our test. There are a few more helper functions that utilize each of the doGET and doPOST methods to perform specific actions that will be called over and over in our tests. These methods are separated into a different class to keep the MyWebServiceTest class as relatively short and clean as possible (since it’s going to house basically all our tests in this demo), and to share functionality with other test classes in the future. Now that we have all the setup and Util methods done, lets create our setup() and tearDown() methods and a @Test to make sure it’s working. // running all the tests. It’s time to refresh and build our project to make sure all our changes are picked up. If our updates were successful, we can now use the any of the data we’ve added in the setup() method in any of our @Test methods. If you had any trouble following along, simply grab the code to this point from github tag: v1.3.zip — Create setup() and tearDown() for Arquillian tests. Now that we know that our database and WebService is working well in our Arquillian tests, it’s time to implement a couple of @Test methods that will ensure our application works as expected. We’ll start by ensuring our GameLink is generated correctly for players who have fewer than five friends. Remember, according to our design, four or fewer friends is not enough to play, so the player should be sent back to index.html if they do not meet this requirement. //Test that the Player has 0 friends and has the correct link. //Test that the Player with 4 friends also has the correct link. In theory, we’ve just tested boundary conditions of zero friends and four friends, and the code should look nearly identical to the test of the GET and POST requests. The WebService is simply expecting a single ArrayList as input with two elements of "newArray" to signify the start of friendList and friendName arrays respecively. We can put as many or as few longs and Strings respectively inro our data arrays to add any number of friends to our Player for a given test method execution. Another build in Forge, and another BUILD SUCCESSFUL!!! Now you’re really getting the hang of it! The next test is for a successful generation of a valid game link for a user with five or more friends. //Test that the Player has 5 friends and has the correct link. //Test that the Player with 10 friends also has a correct link. System.out.println("ID [" + friendID + "] is not among the players friendlist"
//NOTE: Need to add import for StringTokenizer!!! Most of this test is nearly identical to the last, but I’ve added a few helper methods to allow us to do something that goes a step further. As opposed to our check in the last test, which was for our alert to match a static String in the OnClickMethod, here we actually validate that the GameLink we create meets our requirements. Namely we validate that each friendID in the GameLink is actually a friend of the player, and that each friendID matches to one of the friendNames in the same GameLink via a GET request lookup. This test guarantees us that the user will see a game page with valid friend pictures and names at the top of their screens. Note, we only ensure that each ID has a matching name, not vice-versa. Since there are 3 IDs in the list, and 5 names, the user still has to guess – leaving 2 names out. The helper methods should be easy enough to understand. From the bottom up: getListFromString() simply converts a comma seperated string into an ArrayList. The userNameInList() method checks if the name of a User is within an ArrayList. And in isValidGameLinkLists() we parse the Player’s GameLink to get the friendIDList and friendNameList it contains, then perform a GET request on each friendID and check that it’s both an actual friend of the Player, and that it matches 1 of the 5 friendNames. If any of these checks fail, we return false immediately since there’s no sense in checking the rest of the data. If you had any trouble following along, simply grab the code to this point from github tag: v1.4.zip — Arquillian tests for business logic. 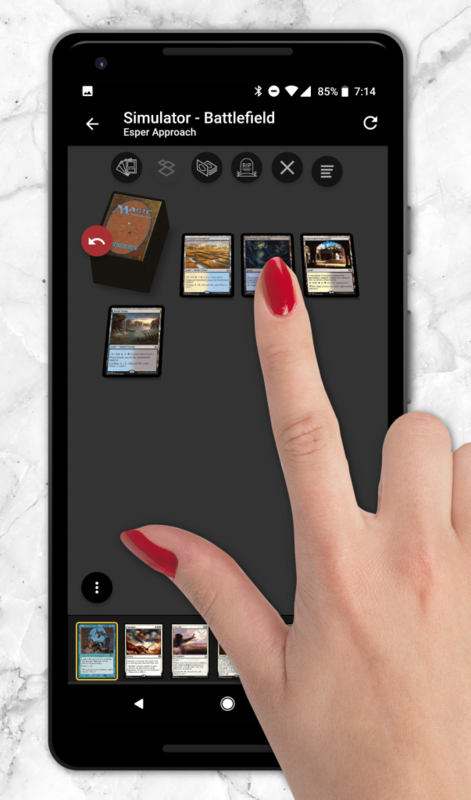 Now that we know the GameLinks are getting set up correctly for Players, it’s time to set up tests for the final step: We’re going to simulate a person going to our app, playing our game, and submitting answers back to our web service. This starts with two tests that will cover all our if statements. One test submits incorrect answers to our web service, and the other submits entirely correct answers. String expectedResponse = "First entry was INCORRECT "
+ "Second entry was INCORRECT " + "Third entry was INCORRECT "
String expectedResponse = "First entry was correct "
+ "Second entry was correct " + "Thrid entry was correct "
If you had any trouble following along, simply grab the code to this point from github tag: v1.5.zip — True End-To-End Integration Tests. String targetURL = baseContext + "rest/webService/GameAnswers/"
Notice how I put a couple of System.out.println statements in there so we can see the response that comes back from the answer POST. When we run this build in Forge, we should now see a failure! // Performs validation on answers submitted, and adjust points. Simply update the @Path and the parameters to the method, and a quick check to make sure JSONInput contains the three name guesses, then assign the three name variables from the JSONInput. Almost done, we need to update our playGame.html so that we can pass our JSONInput as a string of the three name guesses. We update the doPostAnswers() changing the parameters, URL, and passing JSONInput in the xmlhttp.send and we just go back to our tests and update the three tests that submit answers. Finished at last! We’ll run the build one more time, and make sure to refresh our project and fully clean the IDE just to make sure all our changes are going to be picked up. If it doesn’t work, try restarting your local server, and republish your application, just make sure to stop the local server again before you kick off the Arquillian tests. Congratulations! You now not only have a fully functional app, but one that’s fully covered through Automated Integration Tests. You should have no problems adding more functionality now, you’ll know right away if anything happens to break from future changes! If you had any trouble following along, simply grab the code to this point from github tag: v1.7.zip — Fixing Issues and updating tests . As sanity check, we will prove that right now, player’s points will still reset on every restart of the app server since we’re still using hibernate only with create-drop. OpenShift supplies us with a few commands that make this setup very easy, so exit out of Forge (as these OpenShift commands are not part of the Forge plugin). Now go to your app on Facebook and submit a group of answers that will change your point total. Now from a system prompt, run the following commands to stop and then restart the app server again. Go back to your app and notice your points are reset. Since our experiment has confirmed that our database is being deleted every time the server restarts, lets now install MySQL and then we’ll change our persistence settings so data persists even if we upload future changes, or stop the server for any reason. Now we need to update standalone.xml for the MySQL Datasourse. set the enable flag to true, update the connectionURL, username, and password. The above is a sample for my app. Make sure you update the connectionURL, and password to your own info. Then we update our persistence.xml file to set the jta-data-source to java:jboss/datasources/MysqlDS and remove the “create-drop” setting so our data will not get blown away at each server startup. <!-- Using "create-drop" will wipe out your data at each app-server restart. Set it to "update" to have your data persist even after uploading app changes. Or leave it as-is if you always want a fresh database each time you start the app. Lastly, we can install PHPMyAdmin for some finer control of our MySQL DB from a graphical interface on the web. forge> git commit "Added mySQL DB and phpmyAdmin"
Then we can go to: https://fbtutorialdemo-schwarzwaldomain.rhcloud.com/phpmyadmin/ and retype the user and password OpenShift just gave us for a web UI view of our database! If you go to the FBTutorialDemo(AppName) database, we can see our tables, and if you access the facebook app to POST yourself as a User and Player (and all your friends as Users). You can then go back to the phpmyadmin page and into a table like User and hit the Show: button to see all the users now in your mySQL database. Go back and re-run the test from the beginning of this section, change your points (either through the app, or directly in the phpmyadmin site if you know what you’re doing, then stop and restart the server. Make sure your points have not been reset back to the 100 default, and we should be good to go! I hope you enjoyed going through this final article in the series as much as I enjoyed writing it. No application should ever be considered complete without a solid testing strategy and implementation. Arquillian provides us everything we need, since we have all our business logic in our Java WebService class. If you’re currently using Selenium integrated in your JUnit tests, you probably want to take a look at Arquillian Grapheen and Arquillian Drone (two extensions to Arquillian) that will combine the power Selenium gives us to go through web UI flows, with the power of injecting real non-mocked resources into your tests. You’ve just gone from absolute Zero to fully functional app that now has full test coverage with automated tests that run on every build, with a MySQL database to provide persistent data even with server restarts. That should be everything you need to get you on your way, and now it’s time to expand on the functionality, and create your own killer Facebook app. Since you’re familiar with all the tools and concepts now, I recommend you take a “Test Driven Development” approach for all your future work. Write an Arquillian test first, then write the code you need to get it to pass. You’ll maintain your high level of code coverage, and end up writing less code overall; you’ll thank yourself every time you ever feel the need to refactor anything! A very HUGE thank you goes out to Lincoln Baxter, III who continually helped me with all the various errors I would run into when trying to create this demo project. He also spent many painstaking hours helping to format these blog entries and add features on this website, to make them as pretty, and as astectically pleasing as possible for all of you. I’d also like to thank the rest of the JBoss employees that were always nice enough to answer any questions I had. Seriously, use the JBoss and other open source forums, the speed and accuracy of the information you get back is truly amazing! Please follow me on twitter @CavemanCraig for more alerts as I publish future articles or have other OCPsoft updates. Thanks for reading this article series, and good luck on creating the next Farmville! Craig, thanks for writing this detailed tutorial. I have no doubt it will help people find their way writing well-tested Facebook apps in Java EE. Nice work! I have a few clarifications. Feel free to add them to the guide or just leave as an addendum in the comments. * The term “container adapter” is more appropriate than “container” in the sentence “Now it’s time to install an Arquillian container” and subsequent uses. We caused the confusion by mistakenly using the term “container” in the original guides. It was giving people the impression that Arquillian was providing the container, when in fact Arquillian is only connecting to it or controlling its lifecycle. I’ve been gradually trying to correct our terminology. * It’s true that there is no guarantee as to which @Test method will run before any other in JUnit itself, but Arquillian introduces this feature. You can annotated your TestMethods with @InSequence(n) to run them in a defined order (where n is the position in the sequence). * Although there’s no need for the change, I’ll note that when adding only one class to a ShrinkWrap archive, you can use the method “addClass” instead of “addClasses”. To add multiple classes, you can include them all as arguments to a single “addClasses” method, as in addClasses(A.class, B.class, C.class, …). * It’s not necessary to hardcode the database connection information in the standalone.xml configuration for OpenShift. OpenShift sets up environment variables for these connection properties that you can reference in the file. See http://docs.redhat.com/docs/en-US/OpenShift/2.0/html/User_Guide/sect-User_Guide-Using_Environment_Variables.html for instructions. * You can drastically simplify the HTTP requests in your tests by using the Apache HttpComponents library (http://hc.apache.org/). I used it in one of my Java EE workshops and it worked out great. See http://mojavelinux.github.com/asciidoc-examples/javaeeworkshop.html#_writing_real_cloud_tests_with_arquillian for how I used it in my tests. Very valuable article, many thanks! Integration and end-to-end tests should not rely on mocks! Feel free to fork this article on github! (click the github banner) You can make some of these changes yourself! Otherwise, we will update as soon as possible. Ei! I have been following your series, great articles!!! I solved some issues here and there but now I see a problem I don’t know how to solve. I’m sure its a silly/n00bish question but I dont know how to continue. I have tried to use the 80 HTTP port (running jboss as root) but still I get the FileNotFoundException at TestUtils.java line 67. There was some weird problem in my JBoss config … when launched by JUnit in eclipse or forge it didnt work… I hadn’t access to any content of FBTutorial (no index.html, no REST, etc). Tbh I don’t know what thing I changed and now its working… I hate this. Now I have another issue. If I run the tests isolated (PlayerTest and MyWebServiceTest) they work nice. BUT If I try to run them together (ie. forge build –profile… or run whole project as JUnit) then the second one (MyWebServiceTest) doesnt work! It gives weird hibernate errors (USER table not found) and finally it returns and HTTP500 –> JSon syntax exception (it doesnt get the expected object). Any suggestions? Its a bit annoying having to run the tests separately, one by one! When running the JUnit, hibernate creates the tables for both “test.war” (PlayerTest) and “FBTutorialDemo.war” (MyWebServiceTest). Then, runs the tests of “test.war” and after running them, it erases the tables! 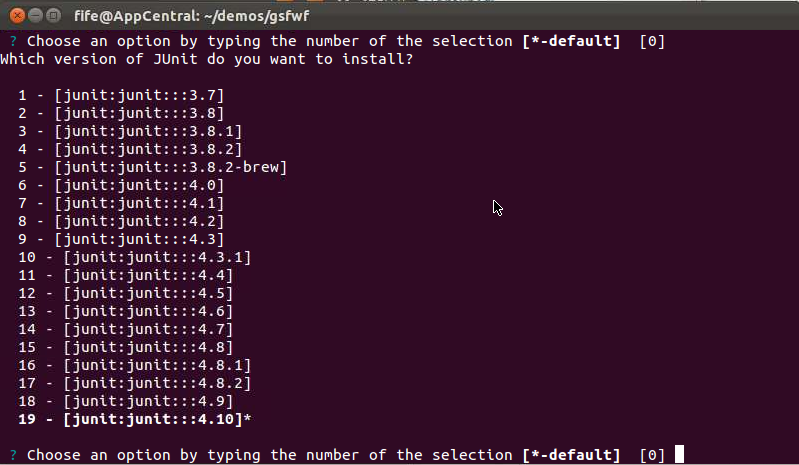 so when it starts running the tests of “FBTutorialDemo.war” the tables dont exists and persistence dont work. So I guess I should tell hibernate not erase tables after the tests are performed? Can I tell it to erase the tables after *all tests* are done?